KANSAS CITY, Mo. – Fifteen point eight seconds. He kicks the dirt a little, ruffles his glove, maybe adjusts his cap, or maybe not, because adjusting his cap takes time, and he doesn't have time. He has 15.8 seconds. It's not a countdown. It's an internal clock, a metronome, a cadence. Rock and fire. Rock and fire. It's almost symphonic, the way Mark Buehrle works a baseball game from atop a pitcher's mound. He throws a pitch every 15.8 seconds, a full 2.1 seconds quicker than the second-most expedient pitcher. To call it anything short of glorious would do it an injustice. Baseball games feel like they last forever these days because they do. Only 20 of 291 pitchers with at least 10 innings this season have taken fewer than 20 seconds to throw a pitch. Five years ago, 107 pitchers worked in less than 20. Since baseball began keeping track electronically in 2007, the longest Buehrle has taken was 18.1 seconds last year, and that was too long. "You see guys get in the batter's box," Buehrle says. "They listen to their song for 20 minutes. They don't swing the bat and they have to step out and tighten their batting gloves and do their stuff. I don't like sitting on the bench for a four-hour game when I'm not pitching, I'll tell you that much. When you're sitting there in between your start, looking at the scoreboard, looking at the clock, saying, 'Holy [expletive], this is ridiculous.' I know how fans feel." Eighty-three point two miles per hour. It's the slowest average fastball in baseball outside of R.A. Dickey's, and seeing as Dickey is a knuckleball pitcher and he throws only 1.2 mph slower, that's not exactly a point of pride. The only onomatopoeia the fastball invokes is "Pffffffft," like a deflating balloon. Calling it a fastball is actually kind of insulting to real fastballs. There are 56 starting pitchers whose changeups are faster than Mark Buehrle's left-handed fastball. "I hit 87 last start," Buehrle says, and he sounds proud, which he should, considering it took Jamie Moyer until his 40th birthday to throw a fastball as slowly as Buehrle does at 34 years old. He maxed out at 85 mph on Thursday. Once. "Over-under is 84 ½," says Aaron Loup, his Toronto Blue Jays teammate. "So he's over." The rest of his fastballs hovered between 81 and 84, his cutter floating from 76-83, his changeup in the same neighborhood with a few mph off the top end, his curve detonating at 69-74. He induced more foul balls than strikes looking and three times as many of those as strikes swinging. There were five whiffs in all, four of them from Justin Maxwell, who swings and misses at one of every six pitches he sees, so those barely count. The numbers are so counterintuitive to success today, so diametrically opposed to a game that hungers for velocity and power because finesse and success are greater bedfellows in rhyme than truth. 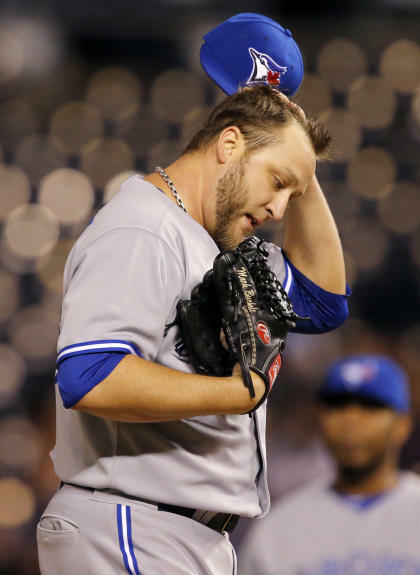 Nobody does what Mark Buehrle does. Nobody. And it's spectacular. Two hundred innings. He's going to do it again, you know. He's going to tie Christy Mathewson and Greg Maddux. And with another year, he's going to be up there with Don Sutton and Gaylord Perry. And two after that, if he's not so bored that he goes home with the $120 million or so in riches he has amassed, most of it rag-armed, he will tie Warren Spahn for a record that was remarkable then and flat inconceivable today. For the past 13 seasons – all 13 full years of his career – Buehrle has thrown 200 or more innings. Most of the years were good. A few qualify as excellent. And there were a couple stinkers by his standards, though not by most. Never has he finished with an ERA that starts with a 2. Hasn't struck out more than 165 in a season, either. And he gives up hits by the bushel, 3,069 in all after Thursday – 413 more than any active pitcher. And you know how much of a damn he gives? The same amount he pays attention to a waistline that has ebbed and flowed and ebbed a little more as his metabolism has slowed down. A starting pitcher, in Buehrle's world, has a job: make the start. He makes his starts. And in those starts, go deep. He goes deep. Even though it's an arbitrary number, the 200-inning threshold means something to pitchers. They hold it dear. In the era of 33 starts a year, 200 innings signifies something. Warren Spahn, back when men were supposedly men, did it 17 times in a row. Mark Buehrle has done it 13 times. The next-best active streaks are from Justin Verlander and James Shields: seven straight years. Buehrle doesn't get it. He doesn't try to. He's not some philosopher, waxing on about how he's some outlier. Rock and fire. Rock and fire. No time to think. "Not throwing hard may be less wear and tear on your body," he says. "I don't know if that's it." "I'm not a workout freak where I do this regimen – this is Day 1, this is Day 2," he says. "I do enough to get by and be ready for my next start." "I don't throw a lot in the offseason," he says. "I don't throw bullpens in between starts. Sometimes I don't play catch in between starts. If we're not hitting BP, I don't go out there." "I wasn't gifted with 90," Buehrle says, "so the man upstairs has gotta give me something." Two point two five ERA. Six starts into the 2014 season, Buehrle sits there, among the American League's finest, and atop the leaderboard with five of the Blue Jays' 13 victories, and relishing this sort of beginning to a season, maybe his finest since 2007, when he threw a no-hitter in April. His oxymoronic fastball still flummoxes with the best of 'em, only it creates an inverse reaction. Instead of hitters walking away saying they can't hit it, they stomp away wondering how they could possibly miss it. "He mixes speeds. He locates. He frustrates you. 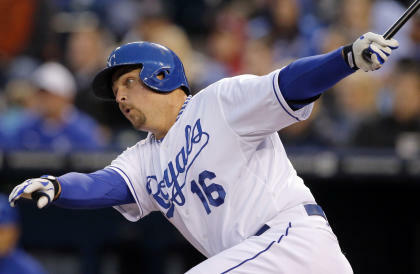 He feeds off your over-aggressiveness," Kansas City Royals DH Billy Butler says. "And he's got a really good changeup. He's always had that. Back-door cutters, front-door. Pounding you in with it. Throwing two-seamers, running them back. He's crafty." That it took more than 1,000 words for that last one to surface took a tremendous amount of restraint. Crafty is a delicious baseball euphemism, like gritty or professional. It means you know how to succeed with complete slop. It's a simultaneous compliment and insult, an homage to the brain and diss to the body, something with which Buehrle may well agree as the rest of baseball waits for an inevitable regression, a return of his home run rate to years past and his ERA to its resting place. It may. It may not. Even broaching that creates the environment in which Buehrle remains underappreciated, even by those who ought to recognize the rarity of his skill set. He works fast and smart and long. That is pitching trinity, not just because it harkens back to baseball of yore but because the principles remain relevant. A Buehrle start is an event because it's almost certain to be quick. It's a treat because he throws unlike anybody in the game. It's a gift because coming up on a decade and a half in the game with an arm that still works is just short of a miracle, or maybe the man upstairs. 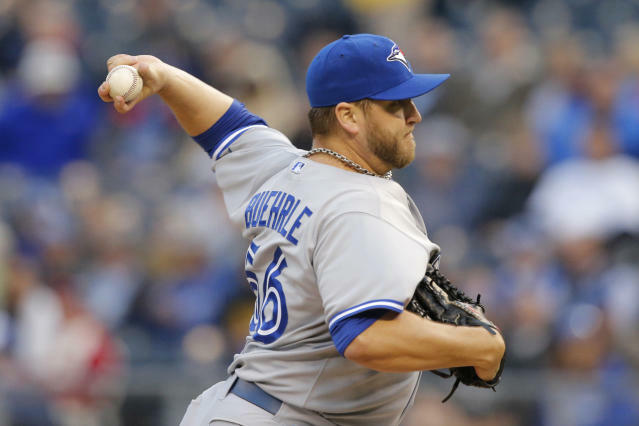 Like clockwork Thursday, Buehrle went 6 2/3 innings, allowed three runs, walked two, struck out four, at one juncture took 8.12 seconds between pitches and led the Blue Jays to a 7-3 victory over the Royals. Time of game: 2 hours, 35 minutes, about a half-hour less than the average. It is the connoisseur's sort of beauty, a celebration of the relative mundane. The husky lefty takes the mound. Rocks and fires. Rocks and fires. Slow, slower and slowest. More and more, never relenting. The symphony echoes. And it's glorious.